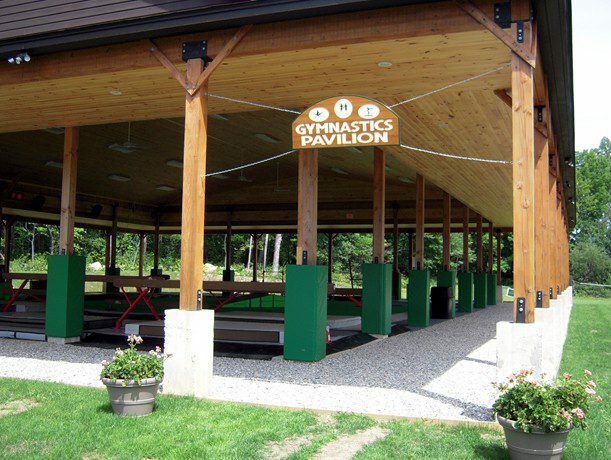 Camp Romaca, located in the beautiful hills of northwestern Massachusetts, contracted US Gym Products to complete a gymnastics gym design. 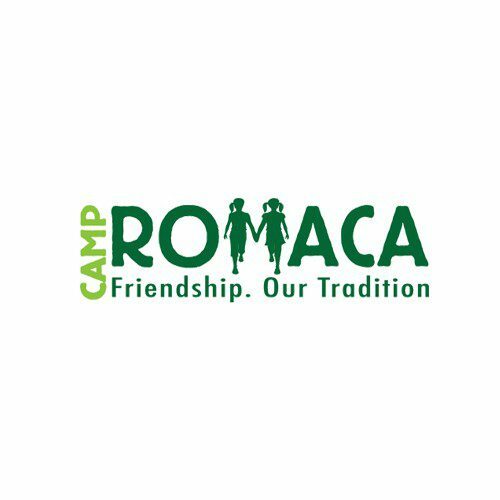 With a very rustic village look that matches the surrounding woods, Camp Romaca fosters young girls into well-rounded, confident young women. 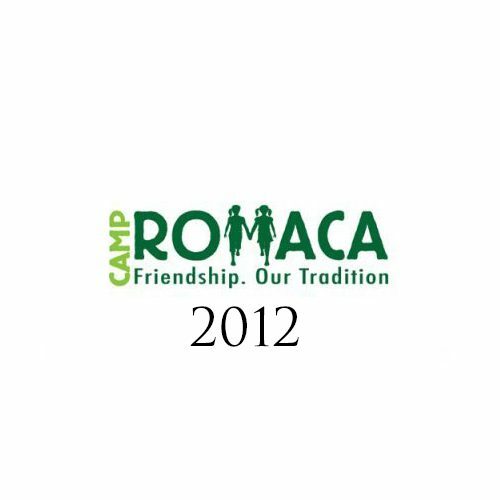 Camp Romaca, founded in 1929, offers a huge variety of activities for their campers. Campers enjoy everything from swimming, soccer, tennis and rock climbing to horseback riding. 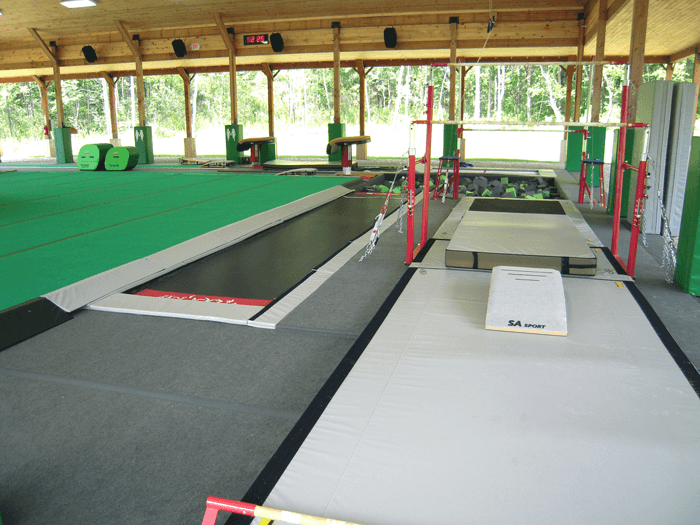 In early 2011, they wanted to upgrade their gymnastics facility from a few pieces of equipment on a basketball court to a world class facility suitable for training athletes at any level. After considering the number of kids this facility must accommodate while also minimizing construction costs, we settled on a 5500 square foot building in which to complete the gymnastics gym design. 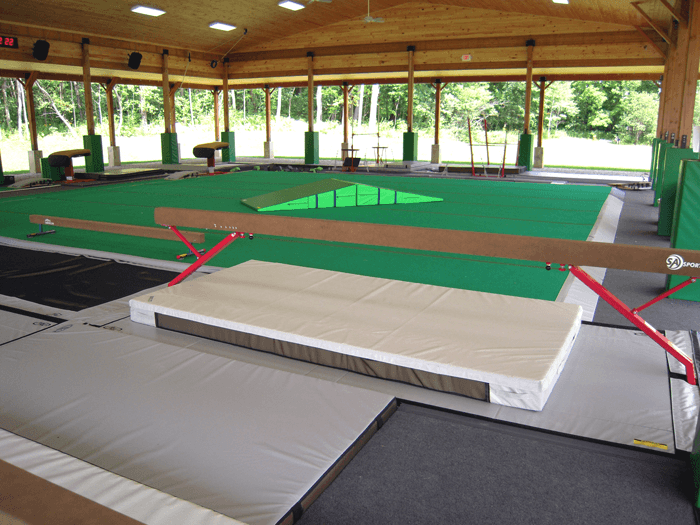 The most notable feature is the open air design permitting gymnasts to experience the beautiful natural surroundings and cool breezes while training. This facility is, by far, one of the most exquisite in this country with its rustic all-wood construction and paneled ceilings. 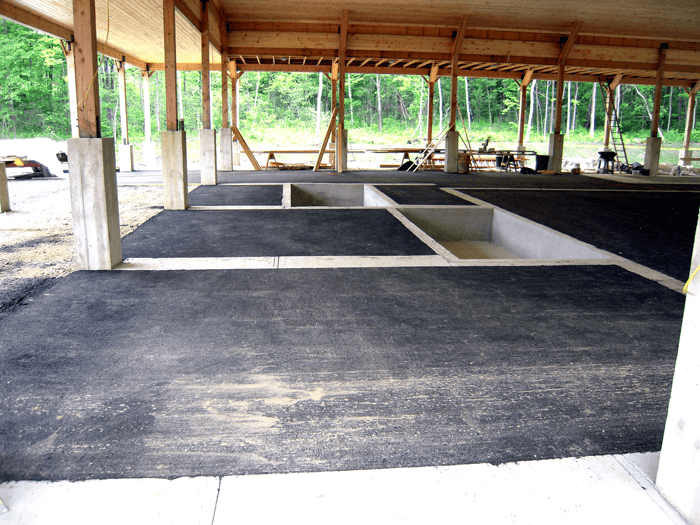 What follows is a series of before and after pictures showing all the pits and foundation work. 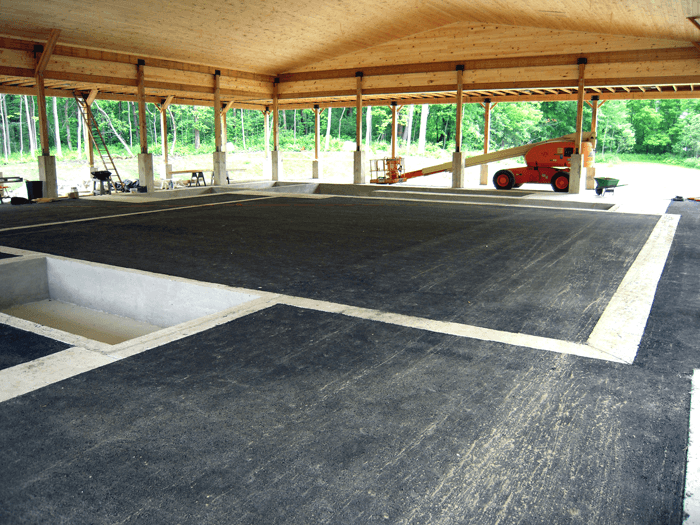 As you’ll see, asphalt, rather than concrete, is used in certain areas to reduce building costs and to better endure cold northern winter climate conditions. Pictured right are before and after images of the beam area. 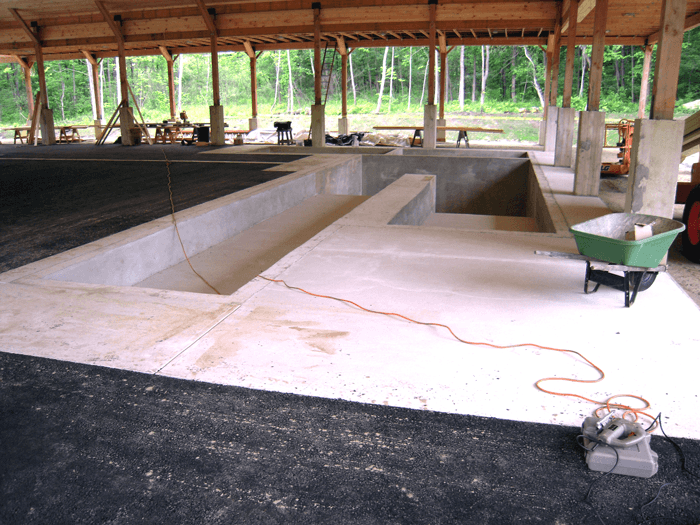 The pit to the right is for a resi mat and the back pit for the deep foam pit. Two beams have access to the resi, one beam for the deep foam and three beams having a hard landing surface. Looking into the facility from the beam area is the spring floor. 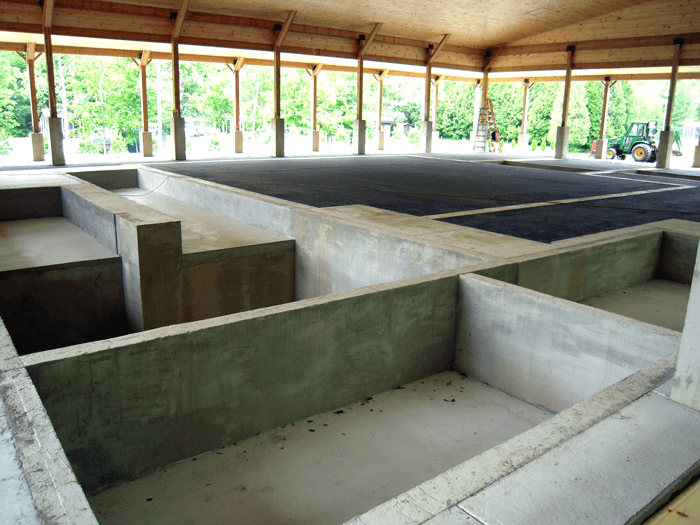 A retention securely bolts into the concrete outline to prevent the floor from shifting. On the opposite side of the gym from the beam area are the bar/tumbling pits. 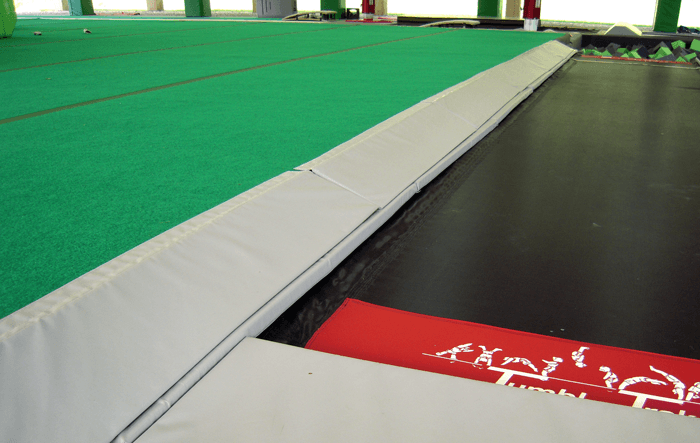 The trampoline shares the resi pit on the right side with one of the vaulting tables. 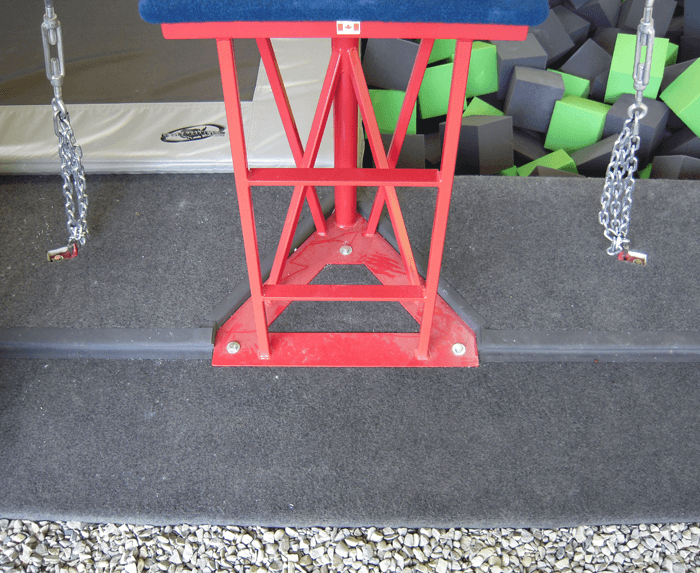 There is a custom 8″ wedge mat that covers the concrete wall between the trampoline and resi pit. 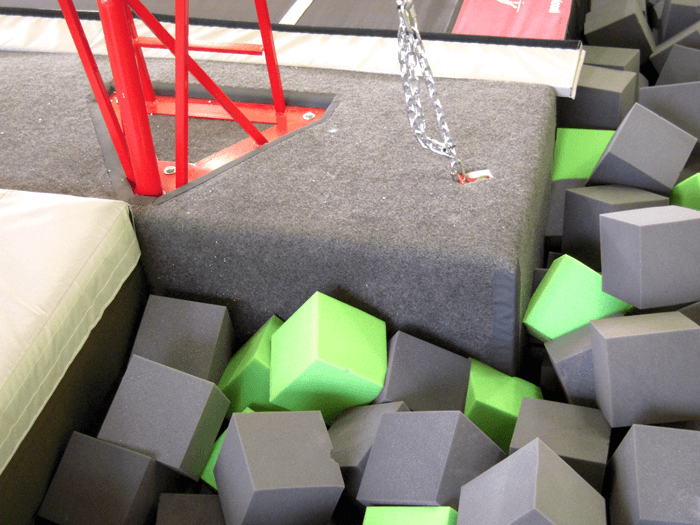 Looking from the other end of the pits, you see the bars and Tumbl Trak both going into the deep foam pit. 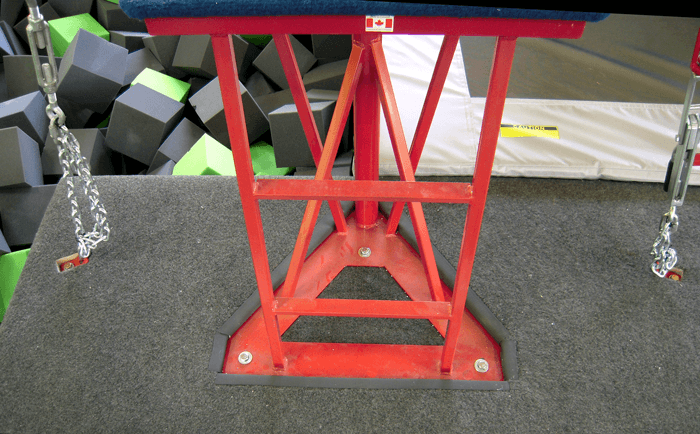 You can also see how the uneven bars and single rail share a resi pit. The left side picture shows the transition we did from the carpet bonded foam (CBF) that lines all the pits to plain carpeting that covers the concrete. 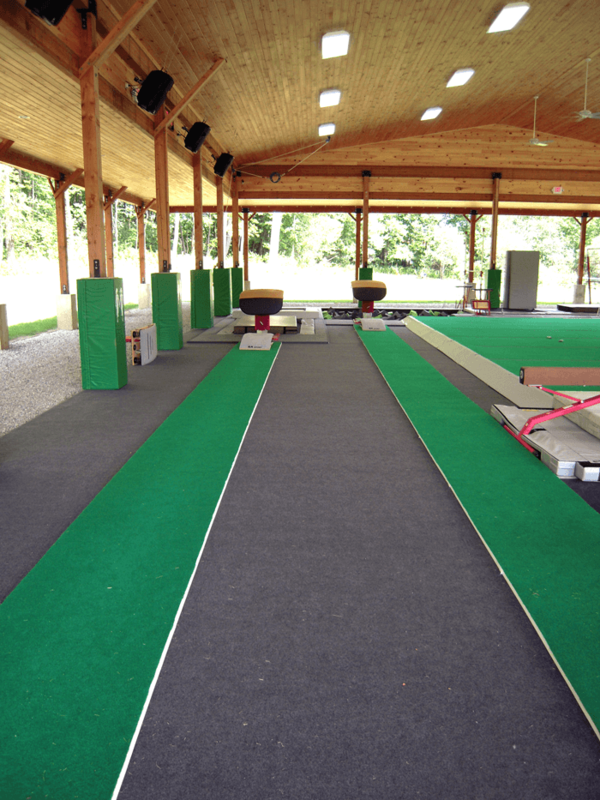 Both pictures highlight the level of detail we did in creating a first-class facility. 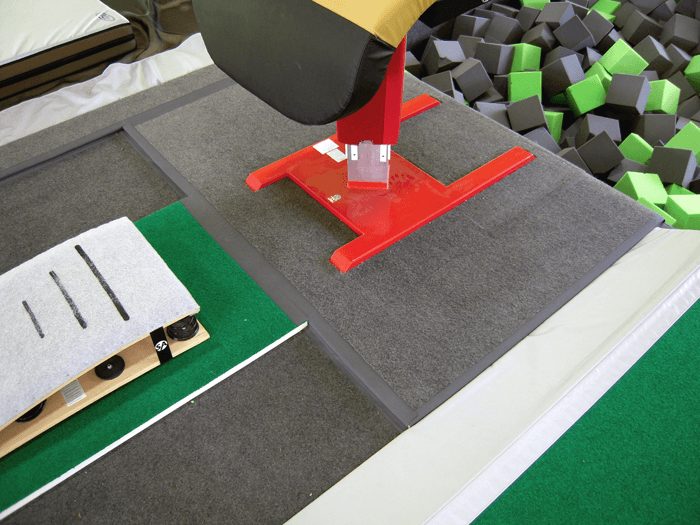 Both single bar bases are cut into the CBF with carpet inserted to cover the concrete and Velcro to cover the white foam of the CBF. 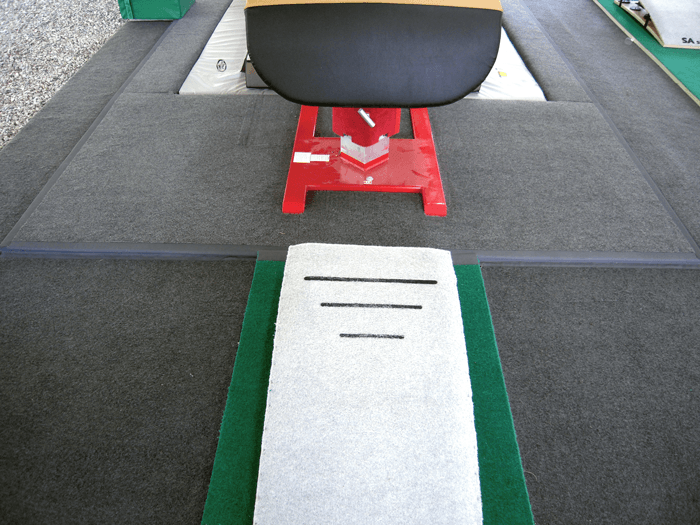 All pits are lined with 1-3/8″ carpet bonded foam for padding. 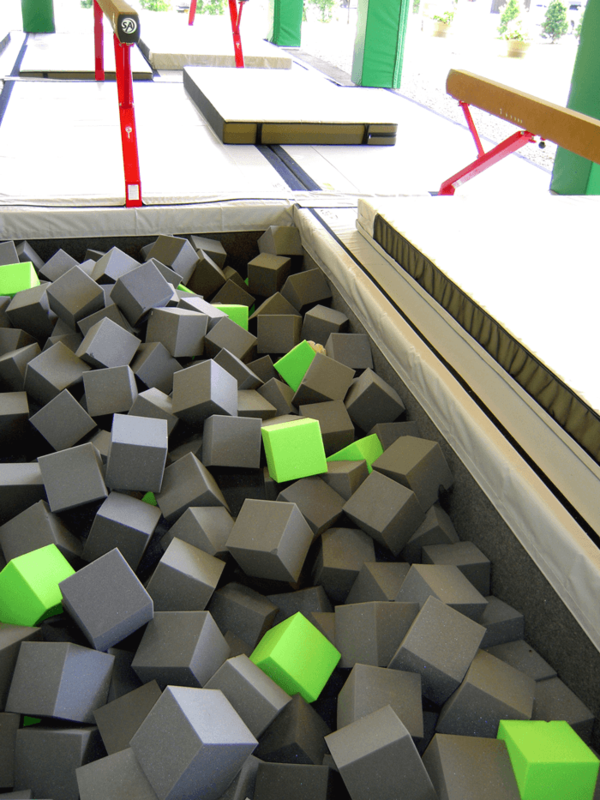 The left image shows the seamless transition of the padding from the top of the pit going down into the pit, all the way to trampoline bed 3′ down. The right picture shows how the concrete island is cleanly covered with one piece of foam. The hallmark of a true world class facility—beyond the equipment—is superior design, masterful installation and an uncompromising commitment to detail and finish work. The level of detail put into this facility puts it into a league of its own. 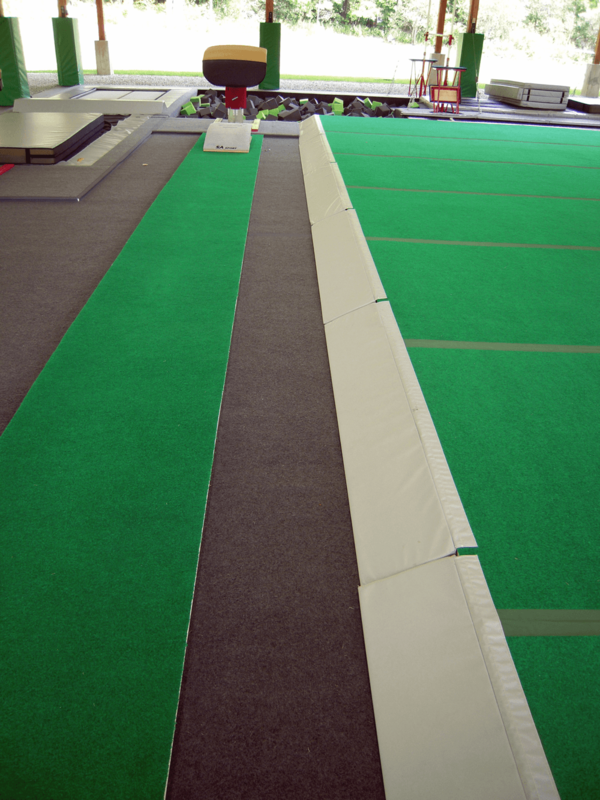 Sloped foam borders transition the spring floor very cleanly and safely down to both the floor and Tumbl Trak. Trampoline pads are perfectly flush with CBF. Note the tight seams and the clean lines and how cleanly the 12cm landing mats transition to wall padding for the beam pit (right picture). 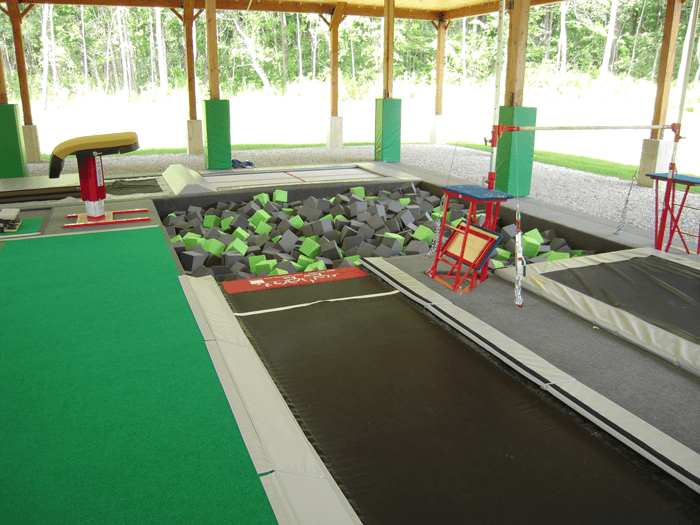 The main pit contains has four separate pieces of equipment that go into it (vault, spring floor, single rail and Tumbl Trak). The trampoline goes into the resi pit. 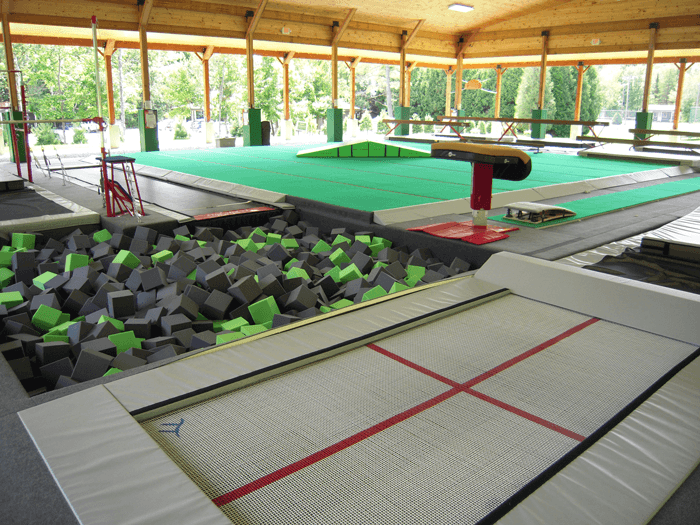 Camp Romaca’s new facility is without question the finest US gymnastics facility operated by a camp of its type. It is not a gymnastics camp but a camp that offers a young girl the experience of a lifetime. It exposes them to dozens of different activities and allows them to grow and learn to become well rounded individuals. 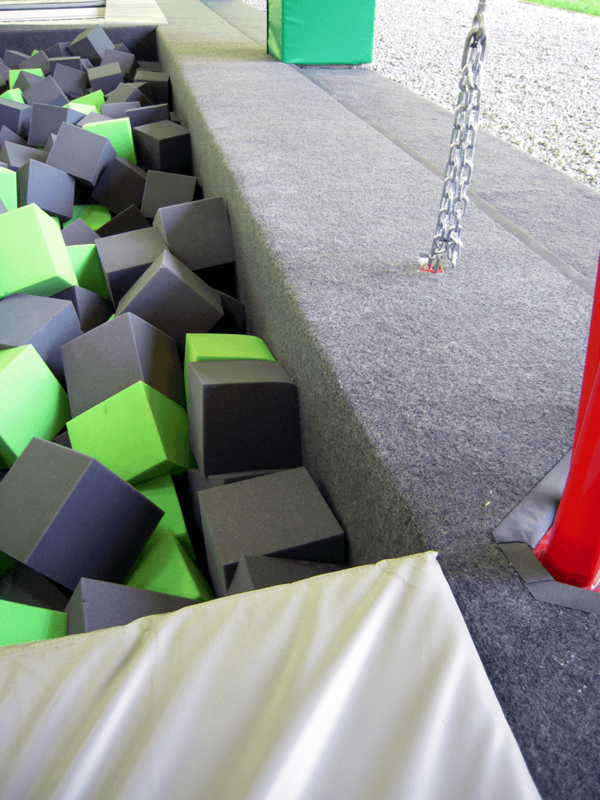 Beyond that, it’s a gymnastics gym design that we are extremely proud to have completed from the ground up. 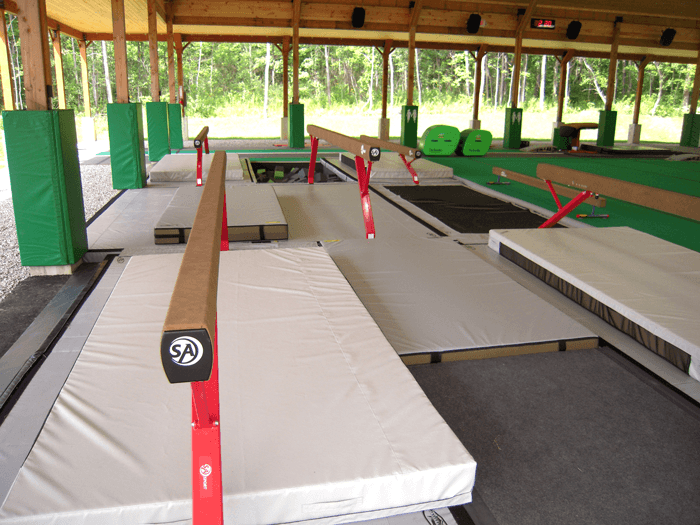 Camp Romana contracted US Gym Products to complete a gymnastics gym design. 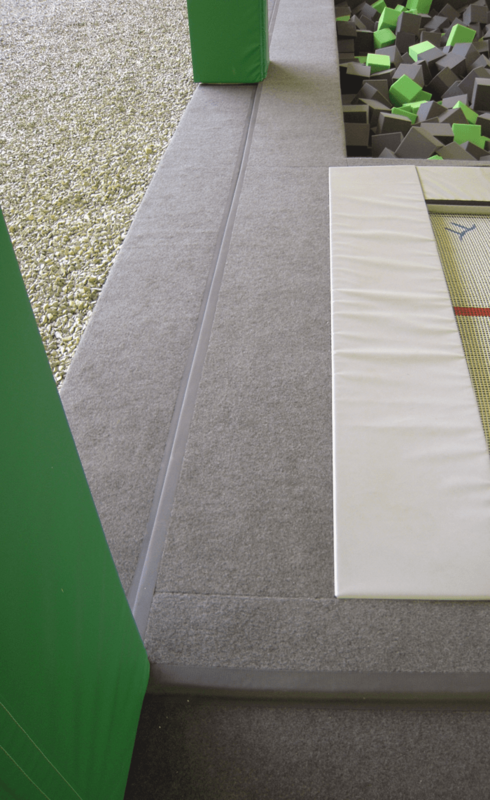 They wanted to upgrade their gymnastics facility from a few pieces of equipment on a basketball court to a world class facility suitable for training athletes at any level.